A truly magnificent offering from the world of HOF rookie cards. 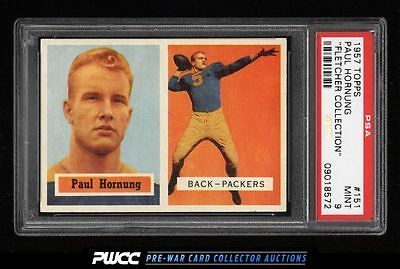 One of fewer than a dozen PSA 9 Hornung examples to emerge from PSA in over 25 years of grading. A dead centered and wonderfully printed specimen which really shines end to end. All told this represents one of the finest investment pieces from the 1950s and comes highly recommended. On the auction block is the current #1 Finest Heisman Trophy winner collection. An all togerther impressive offering which includes many difficult cards within. One of nearly 17,000 cards, lots, and sets up for bid in our 8th Auction of 2016. Click on the link above to view the other PWCC auction lots.